Previous postWith the iPhone 8 and iPhone X, are consumers caught in the middle? A nuclear submarine captain has been relieved of his command after an alleged “inappropriate relationship” with a member of his crew. The Royal Navy captain is being investigated following the allegations, which involve a female member of crew. The BBC understands the captain of the submarine HMS Vigilant is at the centre of the investigation. HMS Vigilant is a Vanguard class submarine based at HMNB Clyde at Faslane in Argyll and Bute. 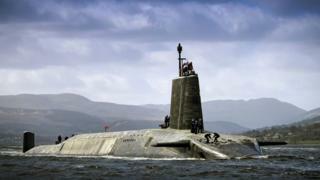 It is one of four British submarines armed with the Trident ballistic missile system. The Royal Navy has confirmed an investigation is ongoing but said it had not had an impact on current operations. A ban on women serving on board submarines was only lifted in 2011. Since then, a few dozen women have undergone specialist training to serve on board Royal Navy submarines. All Royal Navy vessels have a “no touching rule” that prohibits intimate relationships on board, but the Navy takes a particularly harsh view when it might affect the chain of command. In 2014, the first female captain of a Navy warship – HMS Portland – was removed from command after she was found to have breached strict rules on relations with a member of her crew.